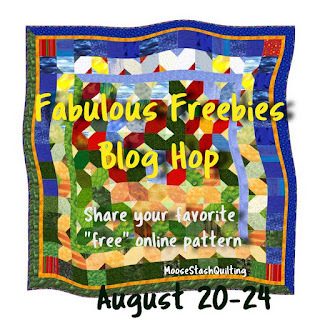 When Joan of MooseStash Quilting announced she was hosting a Blog Hop to showcase some of the free quilting patterns to be found online, I jumped at the chance. It is so much fun to participate in blog hops with a bunch of talented bloggers, and the patterns are FREE! So if you love quilting and free patterns, you are in the right spot! THANK YOU, Joan, for hosting this fabulous blog hop! Today I get to show you my Fabulous Freebie! Long gone now, Quilt Soup used to be one of my favorite blog sites to visit. Barbara Jones, owner of this website, made the greatest projects. They were so creative and always fun. Barbara now designs fabric for Henry Glass & Co., Inc. I feel so lucky to have found her FREE patterns on the Henry Glass website. For my project, I have chosen a quilt she designed called TV B.C. (Before Cable) and uses fabric from her Clean Living line. This is an oh-so-cute quilt made up of 5 retro TV's. As a a product of the 50-60's era, I remember televisions (sans remote) with "rabbit ears" sitting on top. As the youngest in the family, I was the designated channel changer. This is an easy quilt to make using patchwork and applique. The TV set is pieced and goes together quickly. Once the screen part of the TV is made, the antenna, channel knobs, and legs are appliqued to the blocks using fusible web. To keep it simple, I used the raw-edge method to sew my fused pieces in placed. I added the colorful strips panels to the sides and bound the quilt with a lime green border. The finished size of this quilt is 44" x 52," the perfect size to snuggle under when binge watching your favorite television programs. I think this would make an adorable Memory Quilt by substituting the screen fabric with favorite family photos that have been transferred onto fabric. Wouldn't that be cute to send with our kids when they go off to college? I had so much fun making this quilt. If you choose to make this adorable retro quilt, I hope you enjoy it as much as I did. Now go see what other Fabulous Freebies these talented bloggers have found for you. Really cool, retro pattern! Thanks for sharing. Olive and Harvest Gold? The mention gives me the willies just like those colors used to lol. This is such a great pattern. Love your idea of using a photo as the screen. Oh so many ideas. I do remember those wonderful colors from back in the day. And I do remember my dads favorite line "if you're going past the TV could you please change the channel" Great memory, great start to my day. Thank. What a super fun quilt. It's amazing all the free patterns out there. Thanks for sharing this really cute one. I think I have seen this pattern before, but couldn't find it on my computer, so maybe it was a similar one I saw? Anyhow I think it is darling and especially cute with the retro fabric! I might just have to make at least one block. Oh my goodness..if this just isn't the cutest thing I've ever seen. I LOVE it, and the name is perfect. Another project is added to my list now. LOL!! Thanks for sharing this Fabulous Find! That is such a cool, retro yet modern quilt - too fun! Very cute quilt! I agree with you about the photos for the tv screens. Thanks for sharing! What a great idea to make that quilt using photos. I so remember TVs looking like that! Love the idea of BC TV. I never thought about how some would not have ever seen the rabbit ears. Heya Charlene, great to see you, and oh yea, I so remember those days before a remote and the antenna ears on the top of the tv set..sometimes foil was added to get the picture to show up... LOL That is a very cute quilt and so much fun. ty for leading us to the pattern also. This would definitely make a terrific memory quilt - thanks for sharing!